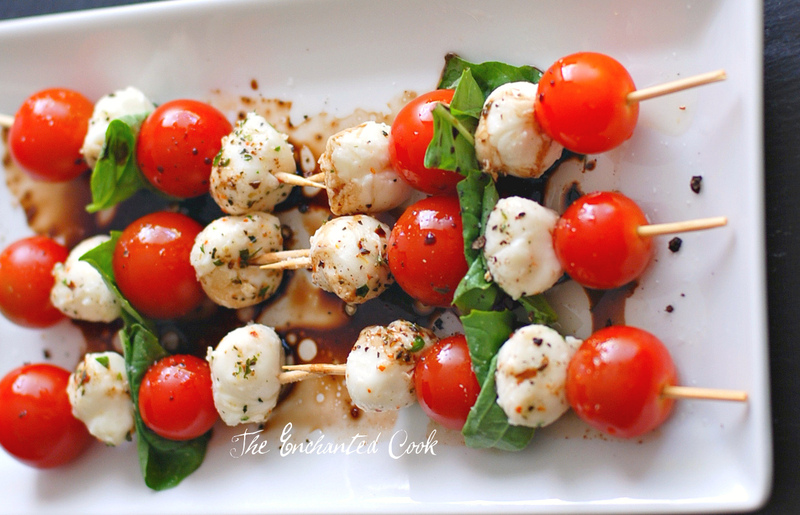 Tomato Mozzarella Skewers are one of my favorite no-cook appetizers. They are quick and easy to pull together and they make an elegant and delicious small plate. No muss, no fuss. They're perfect for a Memorial Day cookout or if you just want to snack on them around the house. I picked up these marinated mozzarella balls at Whole Foods but also saw the same ones at several other markets. They are fabulous. They're marinated in Italian herbs and olive oil and you can just drizzle a bit of the oil over the finished skewers for added flavor. 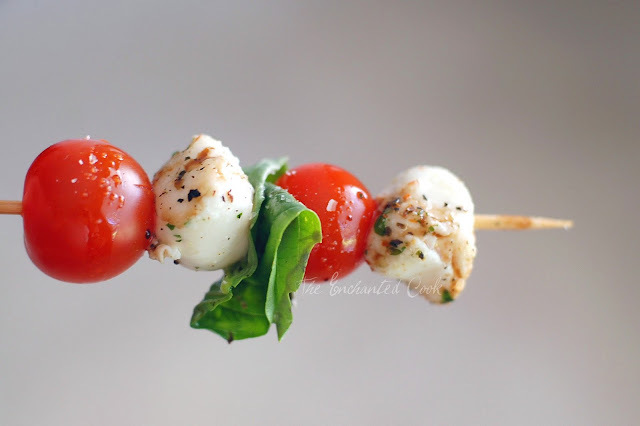 Thread the tomatoes, mozzarella and basil onto the skewers alternating as you go. Arrange the skewers on a plate and drizzle some of the oil from the marinated mozzarella balls over the skewers. Then drizzle the balsamic vinegar - I highly recommend any of O Olive Oil's Balsamic Vinegars - they are fabulous and healthy. Last, sprinkle a little sea salt and fresh cracked pepper atop. I happened upon an episode of Dr. Oz recently where Rachael Ray was guest appearing. She demonstrated her lightened-up version of "You Won't be Single for Long" Vodka Cream Pasta which she dubbed "Now You'll be Living a Lot Longer Spaghetti". 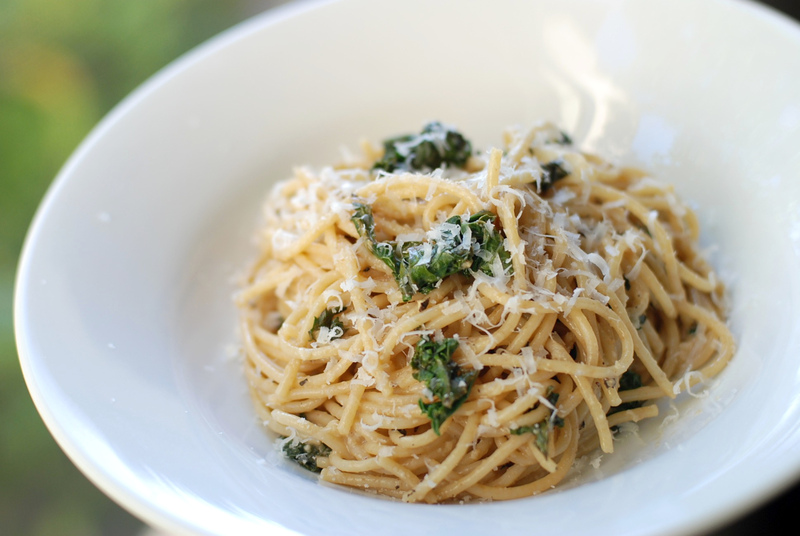 Essentially it's a lightened up Caesar dressing tossed with good-for-you kale and whole wheat spaghetti - YUM-O! Seriously quick-n-easy to make, and seriously good! In my opinion, the anchovies are the key to the well-rounded flavor of this dish, so don't leave them out. You'll end up with a dish that's lacking - one that seems like it's missing something but you just can't put your finger on what it is. It's anchovies! If you've cooked with anchovies before, you know that there's no fishy flavor or odor, and they definitely impart a saltiness that you can't get from salt. If you haven't, I encourage you to try it and let me know what you think. Prepare spaghetti according to package directions, reserving 1/4 cup of the pasta water before draining. While the pasta is cooking, heat a large skillet over medium heat and add olive oil. When oil is warmed add anchovies and garlic and stir until anchovies melt and garlic is fragrant - about a minute or two. Next add the Worcestershire and stir, then add the kale and turn to coat. I used half the bunch of kale but later wished I had used the entire bunch. Add fresh cracked pepper to taste, nutmeg and lemon juice and turn to coat. Let set over low heat while you prepare the rest of the sauce. Take the reserved pasta water and add it a little at a time to the egg yolk beating it as you go, to temper the yolk without cooking it. Next add the drained spaghetti to the skillet, the pasta water/egg yolk mixture, and the Pecorino Romano cheese. Toss to coat and remove from heat. Taste for seasoning and add sea salt and additional fresh cracked pepper if desired. Top with fresh grated Pecorino Romano before serving.